On Monday I eagerly went to the post office to pick up my swap parcel knowing full well it was Columbus Day. No surprise to you that the post office was closed. I thought I was alone when I muttered to myself only to discover a lady behind me who kindly chuckled. She said I was the fourth person in the last ten minutes to do the same thing. I made a bee line back yesterday and I can say that the contents of my little envelope were well worth the wait! My goodies came all the way from Spain from Teresa. I will find out if Teresa has a blog so I can link to it. The strawberries are darling and I love her fabric choices. The attention to detail is superb, look at all those tiny embroidery stitches! I am in love with the measuring washi tape and the cute little pen that writes in the prettiest shade of pink. A girl can never go wrong with candy, either. Thank you, Teresa, I love it! It looks so pretty on my pink cake stand with the doily that I may keep it there to look at it. Blessings! (Update on the Strawberry Pillow post. The block pattern is from the Strawberry Social Quilt pattern by the Pattern Basket. I made three blocks and added fabric to make the size pillow I wanted). Your strawberries are so sweet. What great swap goodies. Adorable package! 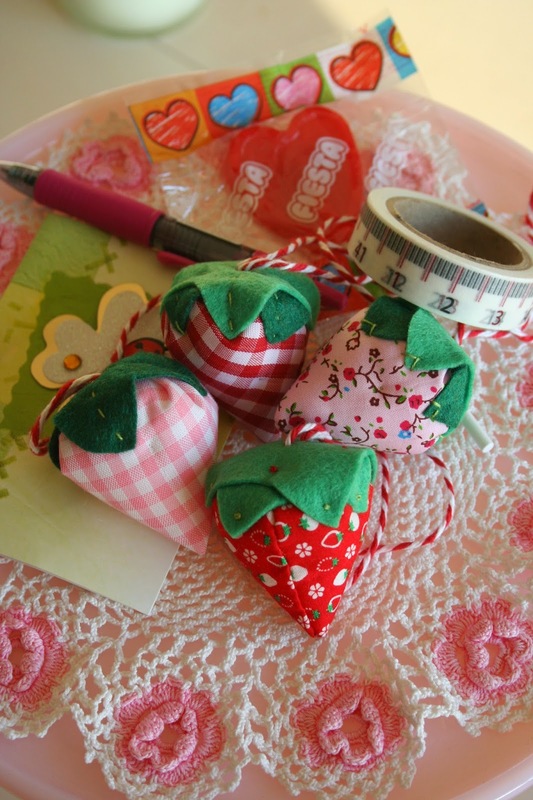 She did such a great job on those strawberries, I love the fabric choices!